You don’t live in a cave—so why the stalactites? It’s been a long winter, but summer is almost here. The lengthening days signal that it is time to start planning some of the regular maintenance every building needs to deal with the winters still to come. Have you noticed long, heavy icicles hanging from your home’s eaves this winter? If you did, the building likely has a problem with ice damming. Examining the damage, effecting repairs and solving the underlying problem should be a priority. Ice damming happens when warm air that rises in a building suddenly hits the frozen roof. Any snow or ice sitting on that roof melts and runs towards the eaves—where it promptly freezes again. That ice plugs the eavestroughs, overflows (hence the icicles) and is often forced into the roof itself. Many think that icicles hanging from the eaves are beautiful, but the water forced into the roof can wind up in the ceiling and walls. 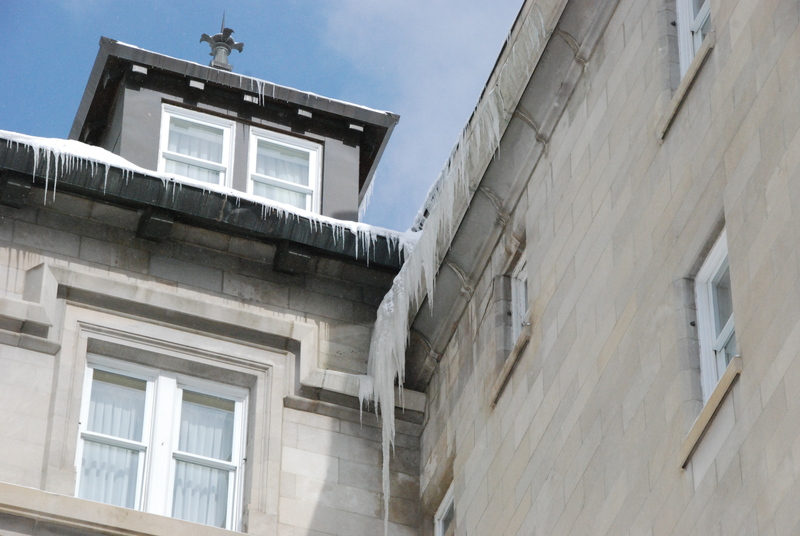 Ice damming is often the root cause of problems with mould, rot and even structural failure. There are several ways to minimise ice damming. Keeping snow off the roof prevents it from melting in the first place. Heat cables can be installed at the base of the roof to prevent water from refreezing at the eaves. However, if the roof is nearing the end of its useful life and in need of rehabilitation, this is an opportunity to address the underlying problem. Ice damming is indeed a symptom of a larger problem with the roof. Those long, heavy icicles are a sign that a roof lacks proper insulation or ventilation. The more heat escaping from the attic, the more quickly the snow on a roof will melt. The more poorly ventilated the roof is, the less likely the rising heat will dissipate evenly. What to do? Careful observation and a little research is always the first step: you cannot solve a problem you don’t understand. Get into the habit of comparing the amount of snow on your roof to the amount on the roofs of other buildings in the area. If snow disappears more quickly from your roof, that could be evidence of poor insulation. If the amount of snow is unevenly distributed a few days after a snowfall, your roofing system may be poorly ventilated. How to fix the underlying problem? Since ice damming is caused by melting snow that quickly refreezes, a solution will limit the amount of heat escaping through the attic while distributing the heat that does inevitably escape evenly across the roof. Be careful—adding too much or the wrong type of insulation or installing it poorly creates its own problems. Insulating a roof in the wrong way can easily compromise the ventilation. The areas where a roof meets the walls will always be warmer than the peak. Proper ventilation moves heat from the warmer to the cooler areas of the roof, limiting the potential for the snow and ice to melt. In older homes, a lack of ventilation is quite common: exposed rafters or decorative boxed-in soffits with crown mouldings often restrict air flow within the attic. There are ways to improve ventilation that do not comprise the heritage value of your home. It’s always a good idea to consult a professional. An architect or roofing engineer can help you evaluate the benefits and drawbacks of different solutions. You must consider all of the variables and materials that compose a roof before implementing a solution:a roof is not just a layer of shingles but a system complete with external and internal components. Matthew Francis, Manager of Municipal Heritage Services with Alberta Culture’s Historic Resources Management Branch, is live-blogging from the U.S. National Trust for Historic Preservation’s Annual Main Street Conference. 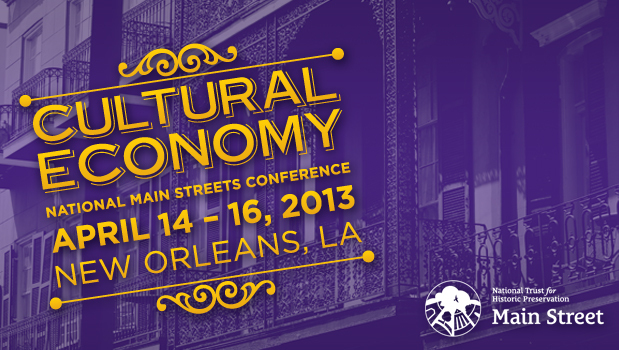 The conference is attended by leaders from hundreds of historic main street communities across North America. Tuesday was the last full day of the formal conference, while Wednesday features a number of post-conference tours to various Main Street communities. I, however, will be travelling back to Edmonton on Wednesday, via Houston and Calgary. Seeing as I would miss the extended tours, I signed up to participate in a mobile workshop called “The Rebirth of Upper Canal Street,” which showcased the renewal of this 18th and 19th century neighbourhood which had endured decades of decline. Now, two distinct districts are emerging along Upper Canal, one with historic theatres, focusing on entertainment, and another focused on biomedical research and development. New Orleans Civil Rights Heritage: Can it be Conserved? 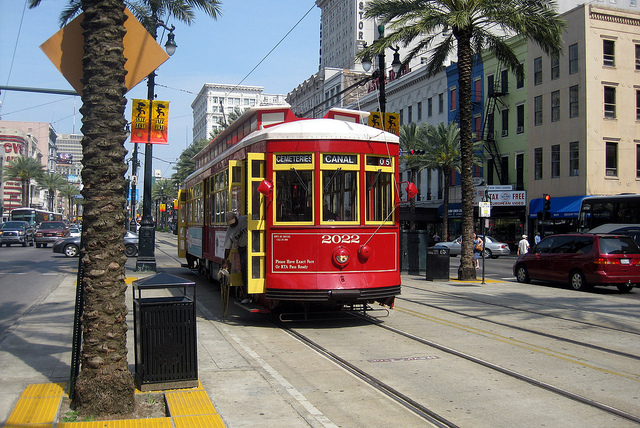 A group of about 20 of us hopped on one of the great streetcars that continually traverse Canal Street, the major thoroughfare through downtown New Orleans. Our guide, the Director of the Downtown Development District of New Orleans, pointed out numerous places of interest within this complex environment. One such building was a now-empty Woolworth’s store, which we learned had been the epicentre of the early Civil Rights movement in Louisiana; this Woolworth’s lunch counter was one of the first to be de-segregated in the 1950s. Now, however, the building lays vacant, and is currently slated for demolition. Across LaSalle Street from Woolworth’s stands the early 20th century Saenger Theater. Damaged extensively during Katrina, but also ailing for some time before that, the theatre was in urgent need of a multi-million dollar rehabilitation if it was to have a future. Through application of historic tax-credit support, in addition to a comprehensive business plan for sustainability, that project is now well under way. I took a picture of the sign to indicate the number of partners – both public and private sector – involved in this massive endeavour. In approximately two years time, this once-great movie palace will again become a centre for performing arts in New Orleans, and will anchor future development on Upper Canal. Across the Street from the Saenger Theatre is the Joy Theater, a 1940s Art Deco gem, now restored to its period of significance. 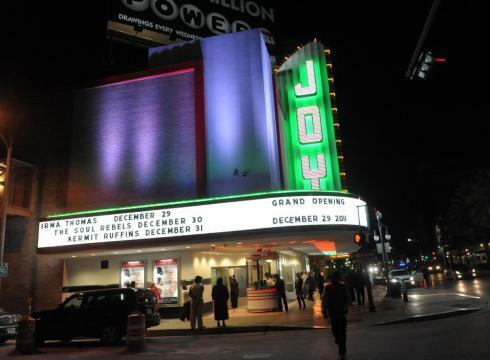 The Joy has already become a popular centre for performing arts and is driving the district as an entertainment hot spot. To my eye, it also bears some resemblance to Alberta’s Garneau Theatre , a Municipal Historic Resource, located in Edmonton. On the next block up from the theatres, several older buildings have been re-purposed for use as medical and scientific research facilities, and new infill, including a multimillion dollar, highly advance centre for “Bio-Innovation,” has been developed. The Upper Canal area will also become home to a new Veteran’s Administration hospital, a 2 billion dollar initiative, replacing an existing hospital devastated by Katrina. The tour concluded with discussion about the ingenuity and collaboration required to facilitate these projects. It was intriguing to see an area like Upper Canal – very much a work in progress – and to anticipated the future results of the work being undertaken today. I’ll conclude my live-blogging from the Conference with one more post on the final plenary session. Stay tuned! Each presentation inspired my enthusiasm and got me thinking on a deeper level. While I could write a lot about each of them (and did take copious notes – it was good stuff! ), for this post, please allow me to just summarize a few of my ‘take-aways,” from the first session. The focus was on collaboration between Main Street Organizations and local governments, which is 100% applicable to the kind of work we do in Alberta, with MHPP and our Alberta Main Street Program. The presenters, which included the Mayor of Washington, Missouri, a city manager, and a State Main Street Program administrator with over 20 years experience, provided some really practical case studies from their work in Missouri. 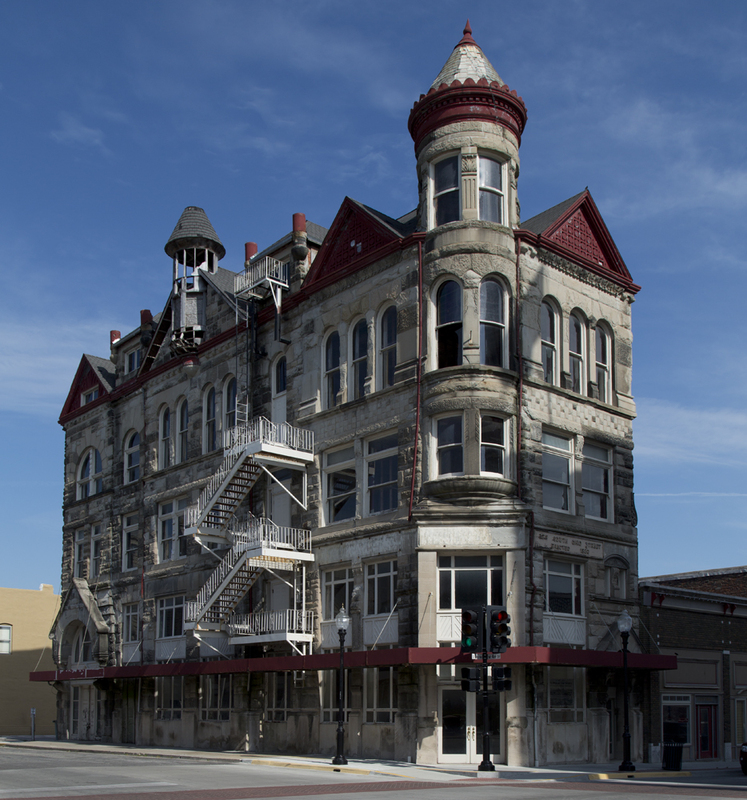 John Simmons described the 16 year process he went through to conserve a “Richardsonian Romanesque” bank building in downtown Sedalia, Missouri. Built in 1888, the building had changed hands numerous times, and had suffered a major fire in the 1990s, leaving it roofless for two years. John candidly described the efforts – including some failed partnerships in the past – that took place before the timing was right to make the conservation achievable. Even now, while considerable work has been done, the actual project is only beginning. John promised an update in two years on the “Missouri Trust Building.” Even though the story is still unfolding, it was a testimony to the tenacity required, sometimes over many years, for a community to achieve its goals of revitalization and heritage conservation. We’ve seen similar challenges with significant historic places in Alberta, and I can think of a few other major projects that may involve these same ingredients – partnerships, creativity, and commitment – if they are to garner both conservation and business success. Not all heritage conservation projects become success stories, but the key message from this session was that greater viability and sustainability is often achieved through partnerships. After Monday afternoon’s two other excellent sessions, we had the evening free to explore the city a little. Here is a lagniappe of my photos from the remarkable French Quarter, steeped in history with a deep connection to Canada (well, pre-Confederation New France). Enjoy! Cafe du Monde, founded in 1862, is located in the French Market, and still serves the same menu of beignets and cafe au lait. Faulkner House, where the great southern novelist William Faulkner lived. Henriette Delille was the founder of an order of African-American Catholic nuns in New Orleans. Jackson Square with St. Louis Cathedral. The Palace Cafe on Canal Street – the illuminated marquis reminds me of the Palace Theatre sign in Calgary. Preservation Hall on St. Peter Street, which some consider to be the birthplace of jazz music. St. Louis Cathedral, East Entrance. After a flight delay in Denver, I arrived in New Orleans just in time to arrive at the Conference’s opening plenary session. This event is always an enthusiastic kick-off to the conference, which (in addition to being educational) has the feel of a mega pep-rally. Each coordinating program brings in its delegation and waves placards announcing the place they are from. For instance, the delegation of Main Street communities from Wyoming was almost a hundred strong on its own! Clad in matching purple T-shirts, the Wyomingians proudly announce that they represent “the Wild West” in New Orleans. 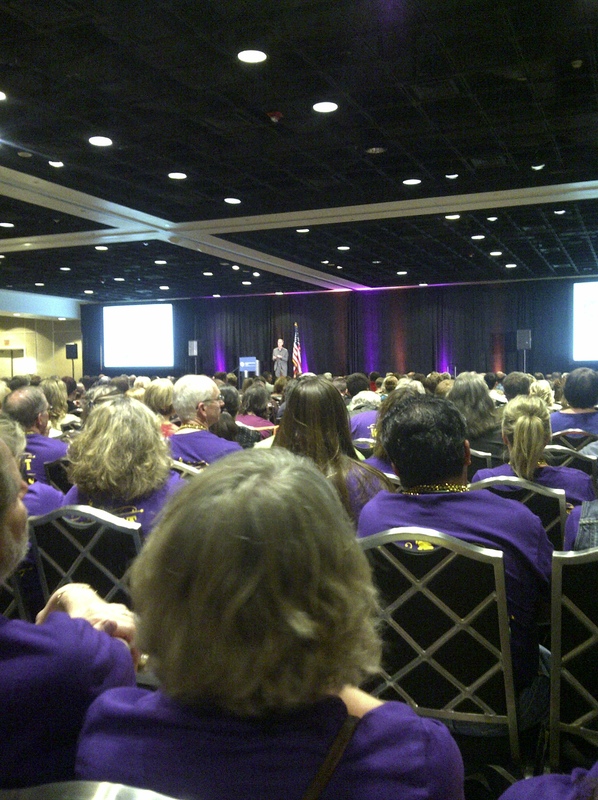 Some purple-shirted Wyoming Main Street leaders, listening to the keynote presentation. 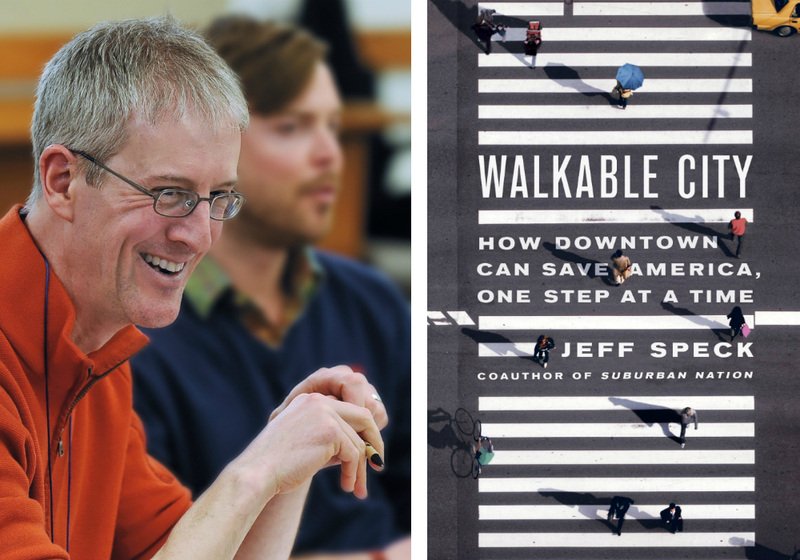 So many factors go into increasing the walkability of our communities, but it is definitely worth taking a good look at becoming more walkable. I will devote another post to saying more about these unique communities, and what we in Alberta could perhaps learn from them. 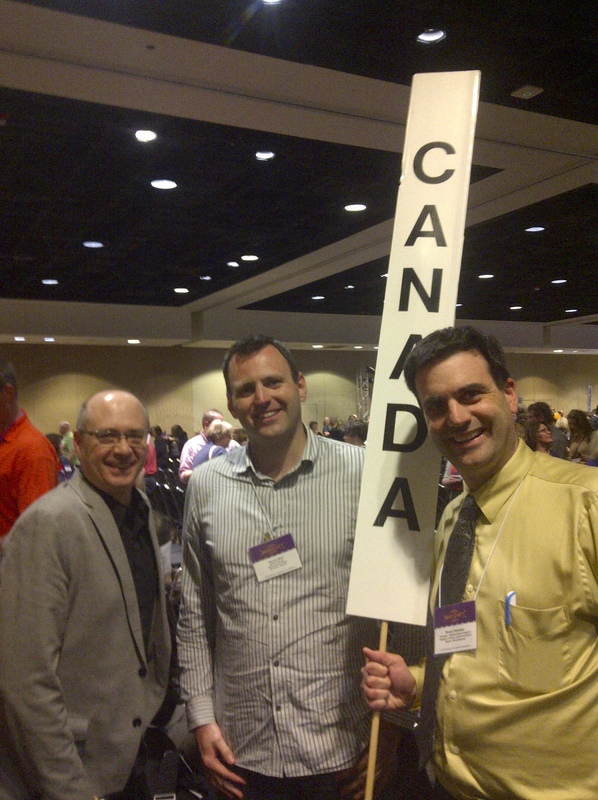 In the meantime, here is a photo of some of our fellow Canadians at the Conference in New Orleans. Alberta’s Historic Places in New Orleans?! 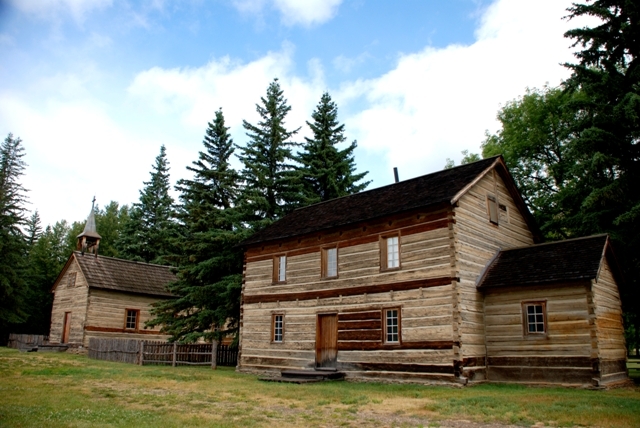 Designated in 2005 as a Provincial Historic Resource, the historical significance of the Hudson’s Bay Company Factor’s House in Fort Vermilion lies in it being the only structural evidence remaining of the presence of the Hudson’s Bay Company in Fort Vermilion. It is significant as well in that, having served as the residence of the Hudson’s Bay Company’s factors just after the turn of the twentieth century, it represents the dominance of the HBC in all aspects of life in this spread out community, which was the largest between Edmonton and the Yukon. It is also significant in that, in its size and with its many facilities, it was the first dwelling of its kind to be constructed in Alberta northwest of the Edmonton district. In 1788, traders for the North West Company established a trading post on the flats of the Peace River at a point near the mouth of the Boyer River. It was called Fort Vermilion, apparently after red ochre deposits in the area. At the time, lands north and west of this point were occupied mostly by members of the Beaver First Nation, who were the initial intended clients of the Company. Once this post was established however, trading was also undertaken with members of the Slavey First Nation, who lived further north and west and also with recently migrated Cree who were now occupying the lands throughout the region. In time, a number of freemen, mostly Metis, came to settle on the river flats outside the Fort and engaged in trading as well. With the incursion of the Hudson’s Bay into the Peace Region in 1815, a rival HBC post called Colville House was established upriver from Fort Vermilion. After a bitter fur trade war, the two companies amalgamated under the single name of Hudson’s Bay Company, and Colville House was closed down. Throughout the rest of the nineteenth century, trade continued at Fort Vermilion, and, after the Irene Farm and Training School was established near the Fort in 1879, further settlement in the area increased. Soon, the HBC itself was maintaining a farm, milling its own grain, and selling the produce, primarily to people further up the Peace River, around Fort Chipewyan and even at HBC posts down the MacKenzie River. This activity picked up after 1899, when the Klondike gold rush and the signing of Treaty 8 brought a cash economy and more people to the north. 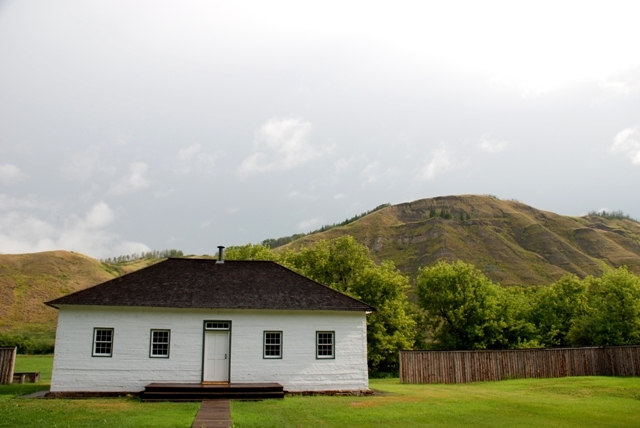 By the end of the nineteenth century, there were more people living around Fort Vermilion than any other community in Canada northwest of the Edmonton district, save for Dawson City. Most of these people were Metis engaged in trapping and small-scale farming. The First Nations of the area preferred to live in the woodlands away from the Fort. The economy of the district continued to centre around the Hudson’s Bay Company trading post, and, even though the fur trade had declined in recent times, business at the HBC farm and grist mill continued to grow. 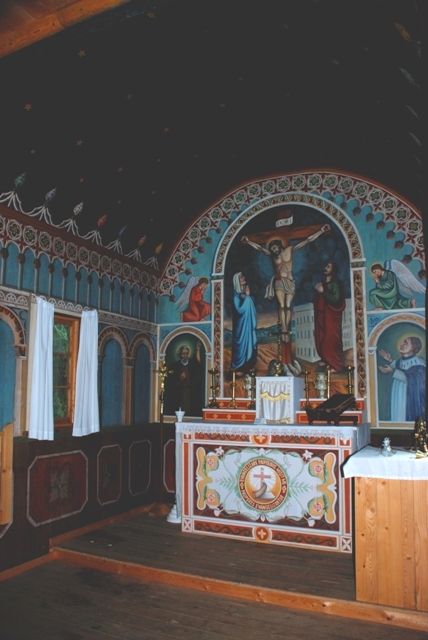 In addition to other small farms in the area, there were now several large ones, such as those of Fred and later Sheridan Lawrence, and that of St. Henri’s Roman Catholic Mission. In 1907, part of Fred Lawrence’s farm would be made over into a federal agricultural research station. All of these farms invariably sold most of their produce to the HBC, especially once the HBC had set up a modern steamroller flour mill, with an auxiliary sawmill and planer, in 1902 for $45,000. By this time, a hundred pound sack of flour produced at Fort Vermilion was selling for 6 dollars, as compared to 10 dollars for those imported from Edmonton. In 1905, the commercial activity of the HBC around Fort Vermilion was augmented by its launching of a large new steam boat on the Peace River called the SS Peace River. At the same time, the HBC decided to provide the overall director of its operations in the area, Factor Frank Wilson, with a new residence on the banks of the river next to the Fort and farming operation. 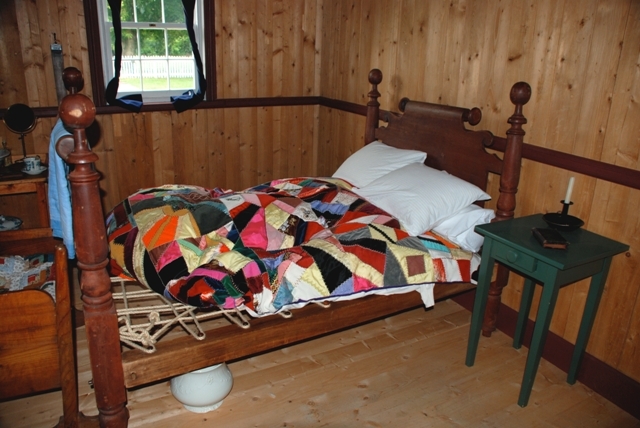 This was a two-and-one-half storey wood frame dwelling, made from wood cut locally and planed at the HBC sawmill. When completed, it immediately stood out as the most fashionable residence in the northwest with four bedrooms, a den, a dining room separate from the living room, a pantry separate from the kitchen, a sitting room, a sewing area, and even an indoor bathroom. This residence, which no doubt was the venue of much business activity on behalf of the HBC, would be a showcase home and a social centre in Fort Vermilion for years to come. Though it ceased to serve the managers of the HBC store during the 1930’s, it continued to be used as a private residence, in time blending with the other large wood frame dwellings nearby. Note: the above material was prepared by a former staff historian. 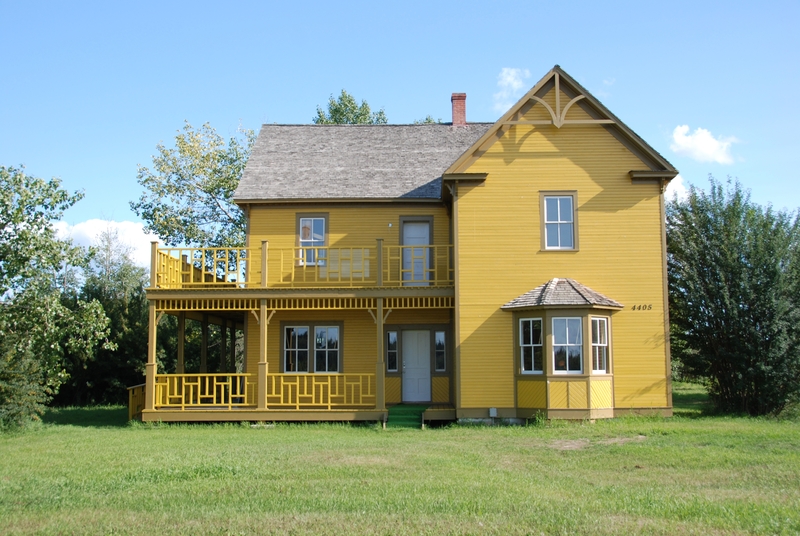 Visit the Alberta Register of Historic Places to learn more about the heritage value of the Hudson’s Bay Company Factor’s House in Fort Vermilion. In order for a site to be designated a Provincial Historic Resource, it must possess province-wide significance. To properly assess the historic importance of a resource, a historian crafts a context document that situates a resource within its time and place and compares it to similar resources in other parts of the province. This allows staff to determine the importance of a resource to a particular theme, time, and place. Above, is some of the historical information used in the evaluation of the Hudson’s Bay Company Factor’s House.